Winter is a hard season for me. I do not like cold, and I have to make myself leave the house. I have to wear more clothes outdoors and in. Outside can look so very bleak. Yet the landscape after a winter storm can be awesomely incredible in its evidence of nature’s strength and ultimate power. Unusual sights emerge like the sun shining through pristine white clouds and bright blue skies while ahead lays a gray sky thick with snow. 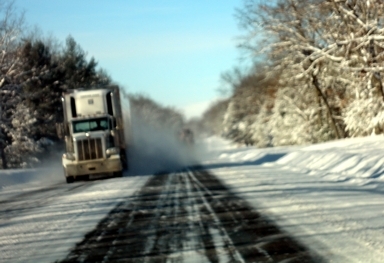 Trees laden with snow and roads lined by ever-growing piles of the snowtruck’s deposits add to the much changed everyday sights. White fields and dark, heavy skies give a reversal of expected outdoors visual weights and I feel like Henny-Penny screaming, ‘The sky is falling, they sky is falling.” The dark, wet bark contrasts starkly with the snow etching each branch, bringing a visual acuity unseen in any other season. When the sun touches weeping willows the branches glow with gold. The burnished russet of last summer’s oak leaves offers a subtle but vivid split compliment to the purple shadowed snow and the deep green of adjacent pines. It is different, strange, gorgeous, overlooked spectacle from the warm landscapes of summer. So too is the awesome effort needed to drive through a storm when caught—devastatingly hideous, scary. A forty-five minute trip can become ninety minutes or more of a dangerous, nerve-racking trek demanding intense attention: Is the dark patch in the road pavement or ice? How far ahead is the car hidden by the billowing snow cast upward by its wheels? Can I pass this car going twenty-five miles per hour on an apparently safe road, or is there an obstacle ahead? If I pull off on the shoulder, will my tires have traction to take off again? Oh no, someone’s slid off the road! Does your garden invite you to walk through it even in the cold? Are you drawn to your windows to enjoy your garden through the winter or do you place a few bird feeders in front of the glass and ignore the garden? If you only watch the birds attracted to your feeders, your garden might lack structure. Structure is the interesting elements remaining when plants are winter dormant. These include man-made structures, trees, shrubs, and natural land variations. Some yards are situated with beautiful natural views, but most of us have our neighbor’s yard, roads, back alleys, or a commercial building to look at – not so an inviting a background for your winter view. As herbaceous plants die to the ground the garden’s ‘bones’ or structure appears. Walkways, fences, ornaments, arbors, planters–anything built forms the unchanging structure of your garden. Trees and shrubs form the living structure. If your garden has ‘good bones,’ its skeleton remains interesting through the bleak months of winter. Winter gardens are often quiet and subtle, providing simple pleasures. The focus changes from the rampant color to softer, grayer colors, and from the abundant flowers of summer to berries that persist on branches long after the first snow, interesting bark, and the pattern of shrub and tree branches. The goal of a winter garden is for you to select plants that add interest to the structure of the garden while hiding less desirable views. Texture and shape become important. Ledges, fences, branches, shrubs, and other landscape items hold the stark white, often sparkling, snow against their darker color. If you yard held mature trees or shrubs when you move in, you were lucky — you already had structure. You can add more. Vines branches add texture to flat fences and walls. Hedges add definition, evergreen shrubs add living freshness. Evergreens come into their own in winter. Their variations of green and blue-green color, the natural texture of their branches, their shape, and the bark on trunks of mature trees are appreciated more in winter. Be aware, however, that a wall of the same evergreen tree or shrub can be oppressive in its sameness, especially when close to a window. By mixing evergreens with deciduous plants you add the interest of contrast to your view. As plants are added to the garden, it is important to consider their year-round qualities. 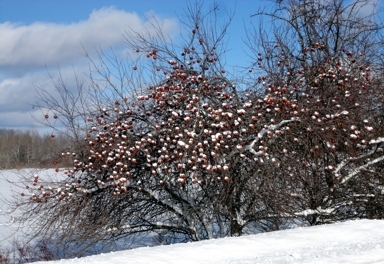 Many Viburnums keep their berries well into winter. Rugosa roses develop colorful red or orange rosehips. Crabapples, junipers, hawthorns, cotoneasters, chokeberries, and mountain ash provide berries that not only add color but also attract birds. Ornamental grasses add wispy accents to the winter garden. Light snow on the blue of Festuca glauca, and frost clinging to the plumes of Miscanthus are pleasing sights. These features may not last as after several heavy snowfalls, they often break down. 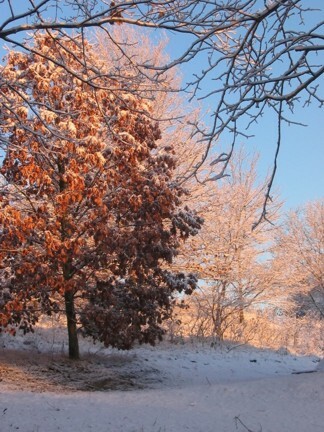 If you cut them down in the fall, you miss a valuable addition to the winter landscape. Winter gardeners appreciate the red and yellow twig colors of the dogwoods and willows, the peeling bark of river birch, or the new birch-borer resistant paper birches. These are the obvious shrubs. There are many that display winter interest. So if your garden disappears under a blanket of snow leaving you with an uninteresting, blah view, start looking around at other gardens. Study the roadside for all the color and texture of shrubs and the interest remaining plant stalks provide. Through careful selection and placement of features and plant materials with structure you can create good ‘bones’ for your garden. Thanksgiving Day we received our first snow, just under an inch that shortly melted. We had a scattering of snow today, too. It has melted, but more is on the way. Last year by this time, the drive had already been plowed three times, and we only plow when the snow is over six inches! Pansies are still blooming in the planters. I LOVE pansies. Blooming indoor plants help keep cabin fever at bay. I planted these Impatiens in November. These are planted in yogurt cups with holes in the bottom. The containers will be washed and reused for years. The cups came with plastic covers which are put on the cups until the seeds have sprouted their first true leaves, then removed. I’ll put these plants in my garden come May. In the meantime, there are a few plants to tend and colorful blossoms to enjoy. As they get a little leggy, I pinch the plants back. These have just been pinched back. It is amazing how quickly the plants respond with new growth. Besides the Impatiens, I also have some Primula coming on from seed. I’ll soon start some herbs and vegetables. Since my last post the area has had over 30″ of snow. I know. I’ve shoveled it all. One of the teachers at the local school said we were having this because the artic is now and island and all that water provides more moisture for snow. Here we also get lake effect snow. Whatever is happening (will the government tell us if there is some catastraphy about to happen?) — it has made a lot of shoveling for me. First snow on my garden. Well, isn’t the last of November a great day to start a blog on gardening in the north? 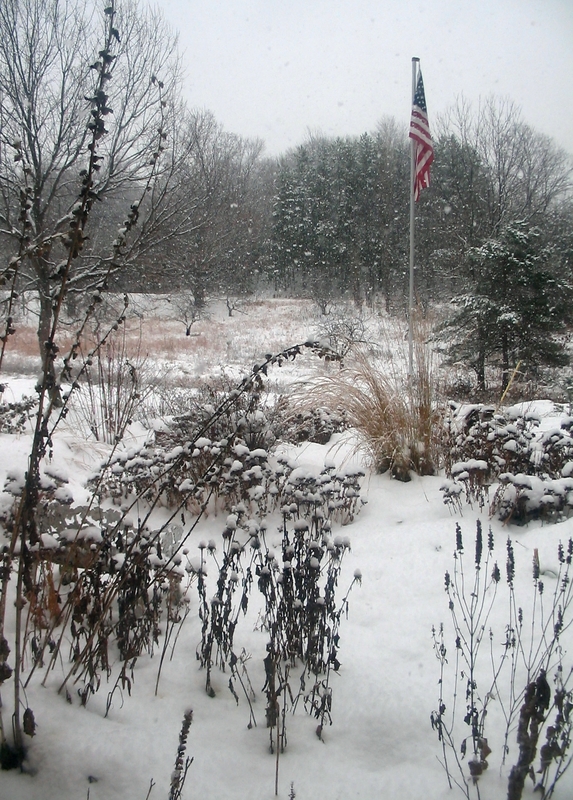 There it is, part of my garden covered with our first sticking snowfall. This is the view from the front window. We’ve had to previous storms but the snow quickly evaporated. 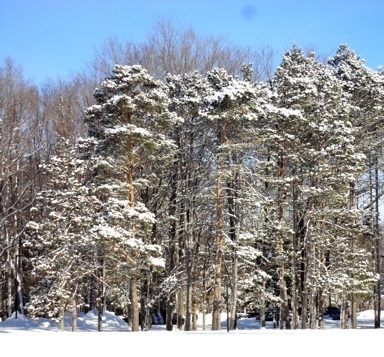 During the course of the winter the snow will slowly pile up to several feet. It shrinks with evaporation, which is a good thing or there might be nine feet or more piled up. This lasts until the end of March with snowstorms not uncommon in April an May. Is it no wonder depression can set in? 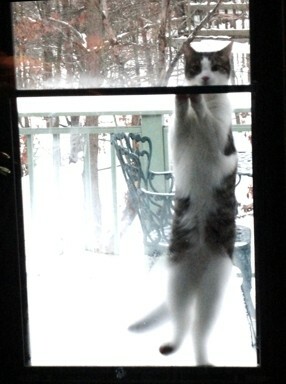 Luckily, there are garden things to do inside.